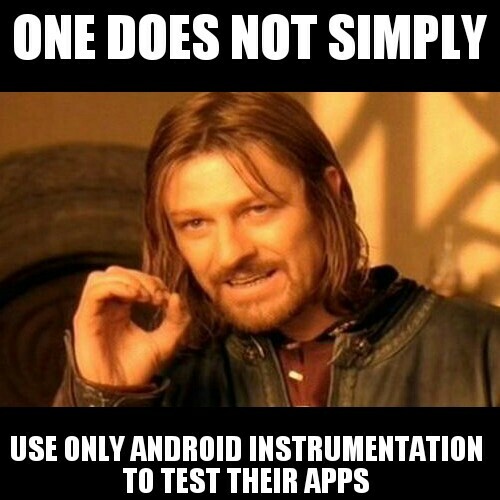 Android’s built-in testing framework is lacking on a number of levels. Enter Robotium, an open-source project. Robotium connects the dots by extending Android’s testing framework and providing convenience methods to help developers rapidly create tests. In this entry I will show how Robotium can be used for data input, finding and testing views and buttons, testing between multiple activities, and testing activities with extras. I’ll also show how to work around issues with race-conditions in UI tests. I have created a GitHub project with a sample application and test project. So now let’s actually write the test. The most essential thing when it comes to testing an Android application is getting access to our views and being able to touch them or change their values. While this is possible with instrumentation, doing so tends to get the developer thinking more about how they are going to manipulate the testing framework to achieve a particular end, rather than just focussing on getting the job done. All we have to do is pass in the view and the text and Robotium does the rest for us. So now we know how to find views, manipulate them, and check them. Now we can do some end-to-end testing between multiple activities. As with everything else that Robotium provides, we can now express our test steps in a way that clearly maps to what the user will experience. Conversely, we don’t always want to be launching our application from scratch for testing. Sometimes we just want to test a specific activity which could be launched with many different extras, and thus will behave differently. And we don’t always want to run through the entire application every time to get to this point, because it can be very time consuming. This is particularly useful for basic validation tests. A common problem with automated UI testing is race conditions. Unfortunately for us, Android is no different. This will set up an animation that fades-out a text view until it disappears. Once the animation is finished the view will be gone from the layout (which means the parent layout will no longer measure it). The animation is set to take 1000ms to complete. On balance, I think Robotium is definitely worthwhile using. The biggest issue in automated UI testing is race conditions, which any framework would experience and for which there are easy solutions. You’ll notice that I have listed Java as both a pro and a con – while it is great for devs to stay using the same language, it’s a much larger barrier-to-entry for business-type folks. As has happened on other mobile platforms, Android applications are evolving from simple toy-apps into feature-rich applications – some of which could even serve as PC replacements. Therefore it is only logical that they should go through the exact same quality-assurance processes that all other software is put through. Robotium is a great framework for making this process as effortless as possible. I am using robotium for the automation android device. I am trying to click on french language using solo.clickOnText(“Français”). junit.framework.AssertionFailedError: No TextView with text Fran?ais is found! It is because of special chracter “ç”. But while it is printing with System.out.println(ExcelInsertion.getContent(“lang”)). It is showing perfect. Is their any way to solve this? I have just started with Robotium and feels its really a good tool. Only thing what I don’t understand is from here methods like testCanOpenSetting() or testBlackbox or etc, is called . Can you explain a bit from where these methods are called or there is some other way to write the method so that they are automatically called. Hi!! I am trying to automate mobile application but I am unable to click on Action Bar that is Sherlock Action Bar.Please tell the solution to click on menus in Sherlock Action Bar.